Pancakes! I have to admit, normally I’m a waffles kind of girl through and through. I can’t get enough of the nooks and crannies for all the syrup and butter to go into and now that I’ve mastered my ultimate vegan waffle recipe, they are a guaranteed winner, every time. Pancakes on the other hand..have always been a challenge. I either cook them for way too long, resulting in a lot of burnt pancakes and a few edible ones, or I undercook them and the middle gets that weird undercooked batter taste that everyone pretends to be ok with, but is actually kind of gross. I wanted fluffy, perfect vegan pancakes that would be slightly crispy on the outside, but really light and sorta bubbly (is that a weird way to say it?) on the inside. I wanted them to absorb a puddle of syrup and get really pillowy, without having a really weighed down feeling to them. Does this make sense? Or am I rambling about pancakes WAY too much? Don’t skimp on the oil! Both in the recipe and in your pan. Don’t skimp on it! You don’t want to make them too oily, but make sure they have a little somethin’ to get just slightly crispy on the outside in. I know that everyone wants to cut a little fat, but what takes these from good –> great is the olive oil in the batter and in the pan. Don’t overmix! For the love of all that is pancakes, DON’T OVERMIX. If you mix your batter TOO much it’s going to become tough and will result in gummy, kinda gross pancakes. Only mix them until they come together and no flour streaks remain, then get to cooking! Sift (aka use a whisk!). Since I’m lazy and never ever actually sift things, make sure you whisk your dry ingredients! This goes without saying in just about every recipe, but especially for fluffy vegan pancakes, you want to make sure you are whisking your dry ingredients before you combine everything together. Ever bitten into a rouge piece of unsifted baking soda before? It’s NASTY. Take it from me. Be patient! This is a hard one for me. If I want pancakes, I want them NOW. But, make sure you are using medium-medium high heat and you will get that perfect cooked on the inside but fluffy and browned on the outside look. Don’t crank the heat up, all you are going to get are pancakes that are burnt and undercooked, all at the same time. Flip at the right time! If I had a nickel for every time I flipped a pancake too soon I would be a dang millionaire. Wait to flip your pancakes until small bubbles start to form on the edges and then flip them carefully. If you slide your spatula under and it feels like it’s sticking, WAIT. Use that cooking intuition and it will guide you right 99% of the time. And that’s it! I know it seems like a LOT, but I’m just telling you about my vegan pancake trials and tribulations so you don’t have to go through them too! People helping people eat good pancakes, that’s really what it’s all about. 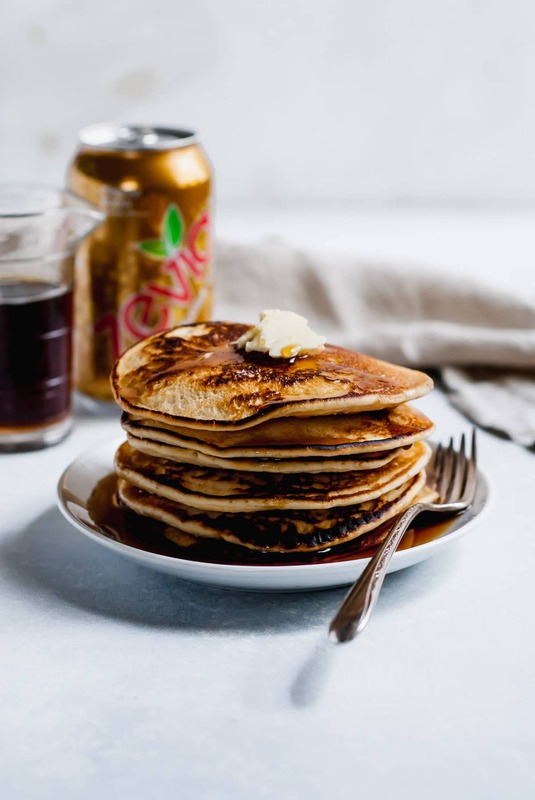 Fluffy, easy vegan pancakes that are made with olive oil and one SECRET ingredient that guarantee a perfect pancake each and every time. In a large bowl, whisk together the flour, baking powder, and salt. Add the almond milk, cream soda, sugar, and vanilla extract. Whisk until no flour streaks remain. Preheat a skillet or pan over medium heat. Grease liberally with nonstick spray or olive oil. 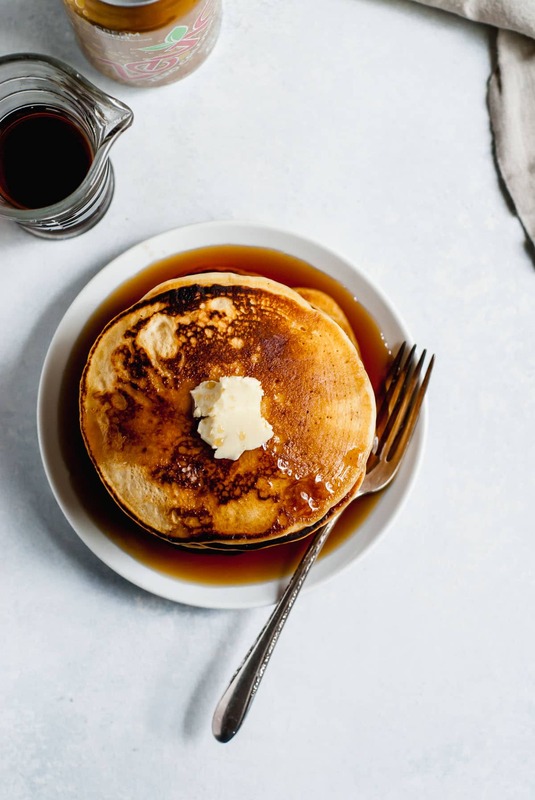 Cook pancakes by the 1/3 cup, scooping the batter out onto the preheated pan and cooking for 2-3 minutes on the first side when small bubbles start to form around the edges and an additional 2 minutes on the other side. Place on cooling rack while batches of pancakes are being cooked, to prevent the bottoms from becoming soggy. Serve immediately. Leftovers can be stored in the refrigerator for up to a week. Make sure you are cooking on medium heat! Anything higher will make them burnt on the outside and gummy on the outside. Use oil on your pan! Otherwise, they will stick and you will be met with a pancake disaster. Although not vegan, will make definitely ! Pinned !